Somethings you just don't want to see when you wake up. Too creepy or odd for your pre-caffeine brain to process, you just know those images will also be stored off to the side of your train of thought all day, and randomly given more attention then they should. 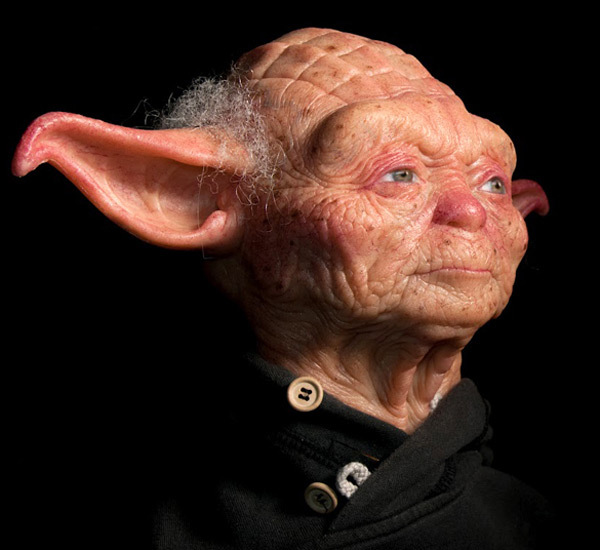 Knowing this realistically coloured Yoda head sculpture has already had said affect on me, in the spirit of giving, I now pass the notion on to you. Avert your eyes kids or you'll never see the over 65's the same again. Yeah I'm sure I've waited impatiently behind this guy at the ATM. Add a speech bubble that says "The force flows strongly through this one. Mmmmm force" and Andrea Eusebi's prized sculpture will have the hairs on the back of your neck standing to attention all day long. To view Andrea's awesome making of gallery, click the jump. This guy looks a 99 years old who had a life of parties! Ha you are right Aliera, although so too could have the original Yoda. I mean nothing silences drunken antic stories getting out about you like the Jedi mind trick, and we all know he's great at that! Ive woken up looking at worse, believe me. LOL too true Karl. I was lucky I wasn't drinking while I read that comment, or my screen would now be wishing it came with windscreen wipers! Was looking better the night before?